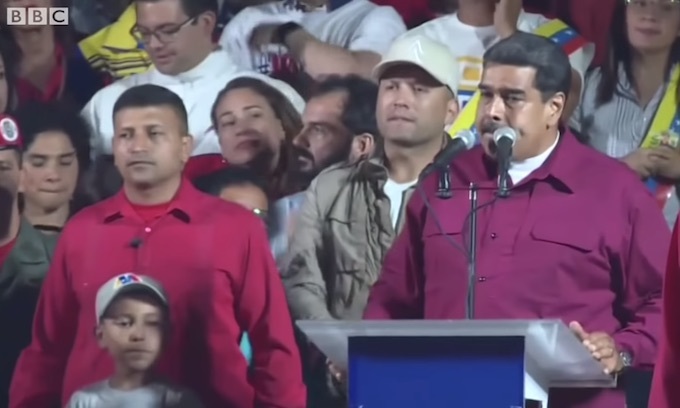 Venezuelan President Nicolas Maduro has announced a 300 percent increase to the nation’s minimum monthly salary — to the equivalent of a few dollars per month. Of course, when there aren’t any private-sector jobs because all industries have collapsed, and when the state companies have only funny money left to pay their slaves — I mean employees — with, the minimum wage doesn’t really matter, does it? And this is what the left is wanting to import here..
I’ll bet their citizens don’t have the right to keep and bear arms. Otherwise, the people of this oil rich country wouldn’t be starving to death. Socialism; the political system that kills. It’s more demonic than you think… it’s like a cancer… socialism can’t survive without Capitalist money… and… socialism kills Capitalism… therefor socialism Kills the host that sustains it’s life… just like CANCER!! Heck, i doubt the citizens down there, have ANY rights these days..
this is what POWER in the wrong hands looks like! pelosi,schmucko schumer and waters and s.j.lee. is the kind of power they want over you! A friend once gave me a $10 trillion bill from a third-world country worth about 75 cents American. The real value is based on market price while the issuer was printing more ‘money’ every day in a vain (counter-productive) attempt to add value to their economy. It matters not (IMO) If we do share this, or ANY OTHER story like it, showing just how bad socialism is.. THEY ARE INCAPABLE Of recognizing facts, seeing the truth, or opening their minds to ANYTHING that isn’t spoon fed to them, by their libtard indoctrinators.